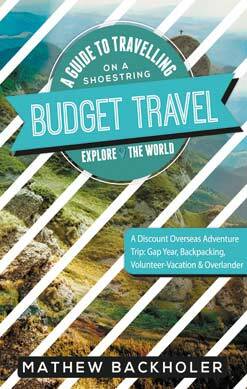 Budget Travel, A Guide to Travelling on a Shoestring is a practical and concise guide to travelling the world and exploring new destinations with fascinating opportunities and experiences. Full of anecdotes, traveller’s advice, informative timelines and testimonies, with suggestions, guidance, ideas and need-to-know information to help you survive and thrive on your budget travels and have the adventure of a lifetime! Whether you go solo, join with friends, participate in humanitarian work, join an overland bus trip or take your own vehicle, this book is for you. Transportation – Buses, Trains, Taxis etc. As a world traveller, Mathew Backholer has visited more than forty countries and has travelled the length of Africa, from Cairo to the Cape, across South-East Asia from India to Vietnam and from Nepal to Russia via China and Mongolia and has survived the Trans-Siberian Railway. He has driven around Europe, visited North Africa six times, and has journeyed alone, with friends, as part of team and as a leader. He is the co-founder of ByFaith Media (www.ByFaith.org) and films and presents the reality mission travel series ByFaith TV which airs globally on numerous networks. He is the author of many books, including: How to Plan, Prepare and Successfully Complete Your Short-Term Mission and Extreme Faith.